Hearing aids are used for a variety of pathologies including sensorineural hearing loss, conductive hearing loss, and single-sided deafness. Hearing aid candidacy is typically determined by a Doctor of Audiology, who will also fit the device based on the nature and degree of the hearing loss being treated. The amount of benefit experienced by the user of the hearing aid is multi-factorial, depending on the type, severity, and etiology of the hearing loss, the technology and fitting of the device, and on the motivation, personality, lifestyle, and overall health of the user. Hearing aids are incapable of truly correcting a hearing loss; they are an aid to make sounds more audible. The most common form of hearing loss for which hearing aids are sought is sensorineural, resulting from damage to the hair cells and synapses of the cochlea and auditory nerve. Sensorineural hearing loss reduces the sensitivity to sound, which a hearing aid can partially accommodate by making sound louder. Other decrements in auditory perception caused by sensorineural hearing loss, such as abnormal spectral and temporal processing, and which may negatively affect speech perception, are more difficult to compensate for using digital signal processing and in some cases may be exacerbated by the use of amplification. [page needed] Conductive hearing losses, which do not involve damage to the cochlea, tend to be better treated by hearing aids; the hearing aid is able to sufficiently amplify sound to account for the attenuation caused by the conductive component. Once the sound is able to reach the cochlea at normal or near-normal levels, the cochlea and auditory nerve are able to transmit signals to the brain normally. There are several ways of evaluating how well a hearing aid compensates for hearing loss. One approach is audiometry which measures a subject's hearing levels in laboratory conditions. The threshold of audibility for various sounds and intensities is measured in a variety of conditions. Although audiometric tests may attempt to mimic real-world conditions, the patient's own every day experiences may differ. An alternative approach is self-report assessment, where the patient reports their experience with the hearing aid. The most reliable method for assessing the correct adjustment of a hearing aid is through real ear measurement. Real ear measurements (or probe microphone measurements) are an assessment of the characteristics of hearing aid amplification near the ear drum using a silicone probe tube microphone. Body worn aids were the first portable electronic hearing aids, and were invented by Harvey Fletcher while working at Bell Laboratories. Body aids consist of a case and an earmold, attached by a wire. The case contains the electronic amplifier components, controls and battery, while the earmold typically contains a miniature loudspeaker. The case is typically about the size of a pack of playing cards and is carried in a pocket or on a belt. Without the size constraints of smaller hearing devices, body worn aid designs can provide large amplification and long battery life at a lower cost. Body aids are still used in emerging markets because of their relatively low cost. Behind the ear hearing aids are one of two major classes of hearing aids - Behind the ear (BTE) and In the ear (ITE). These two classes are distinguished by where the hearing aid is worn. BTE hearing aids consist of a case which hangs behind the pinna. The case is attached to an earmold or dome tip by a traditional tube, slim tube, or wire. The tube or wire courses from the superior-ventral portion of the pinna to the concha, where the ear mold or dome tip inserts into the external auditory canal. The case contains the electronics, controls, battery, and microphone(s).The loudspeaker, or receiver, may be housed in the case (traditional BTE) or in the earmold or dome tip (receiver-in-the-canal, or RIC). The RIC style of BTE hearing aid is often smaller than a traditional BTE and more commonly used in more active populations. BTEs are generally capable of providing more output and may therefore be indicated for more severe degrees of hearing loss. However, BTEs are very versatile and can be used for nearly any kind of hearing loss. BTEs come in a variety of sizes, ranging from a small, "mini BTE," to larger, ultra-power devices. Size typically depends on the output level needed, the location of the receiver, and the presence or absence of a telecoil. BTEs are durable, easy to repair, and often have controls and battery doors that are easier to manipulate. BTEs are also easily connected to assistive listening devices, such as FM systems and induction loops. BTEs are commonly worn by children who need a durable type of hearing aid. In the ear aids (ITE) devices fit in the outer ear bowl (called the concha). Being larger, these are easier to insert and can hold extra features. They are sometimes visible when standing face to face with someone. ITE hearing aids are custom made to fit each individual's ear. They can be used in mild to some severe hearing losses. Feedback, a squealing/whistling caused by sound (particularly high frequency sound) leaking and being amplified again, may be a problem for severe hearing losses. Some modern circuits are able to provide feedback regulation or cancellation to assist with this. Venting may also cause feedback. A vent is a tube primarily placed to offer pressure equalization. However, different vent styles and sizes can be used to influence and prevent feedback. Traditionally, ITEs have not been recommended for young children because their fit could not be as easily modified as the earmold for a BTE, and thus the aid had to be replaced frequently as the child grew. However, there are new ITEs made from a silicone type material that mitigates the need for costly replacements. ITE hearing aids can be connected wirelessly to FM systems, for instance with a body-worn FM receiver with induction neck-loop which transmits the audio signal from the FM transmitter inductively to the telecoil inside the hearing instrument. Mini in canal (MIC) or completely in canal (CIC) aids are generally not visible unless the viewer looks directly into the wearer's ear. These aids are intended for mild to moderately severe losses. CICs are usually not recommended for people with good low-frequency hearing, as the occlusion effect is much more noticeable. Completely-in-the-canal hearing aids fit tightly deep in the ear. It barely visible. Being small, it will not have a directional microphone, and its small batteries will have a short life, and the batteries and controls may be difficult to manage. Its position in the ear prevents wind noise and makes it easier to use phones without feedback. In-the-canal hearing aids are placed deep in the ear canal. They are barely visible. Larger versions of these can have directional microphones. Being in the canal, they are less likely to cause a plugged feeling. These models are easier to manipulate than the smaller completely in-the-canal models but still have the drawbacks of being rather small. In-the-ear hearing aids are typically more expensive than behind-the-ear counterparts of equal functionality, because they are custom fitted to the patient's ear. In fitting, the audiologist takes a physical impression (mold) of the ear. The mold is scanned by a specialized CAD system, resulting in a 3D model of the outer ear. During modeling, the venting tube is inserted. The digitally modeled shell is printed using a rapid prototyping technique such as stereolithography. Finally, the aid is assembled and shipped to the audiologist after a quality check. 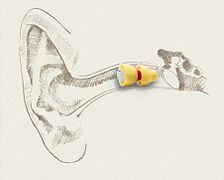 Invisible in canal hearing aids (IIC) style of hearing aids fits inside the ear canal completely, leaving little to no trace of an installed hearing aid visible. This is because it fits deeper in the canal than other types, so that it is out of view even when looking directly into the ear bowl (concha). A comfortable fit is achieved because the shell of the aid is custom-made to the individual ear canal after taking a mould. Invisible hearing aid types use venting and their deep placement in the ear canal to give a more natural experience of hearing. 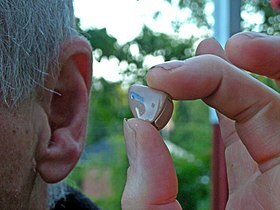 Unlike other hearing aid types, with the IIC aid the majority of the ear is not blocked (occluded) by a large plastic shell. This means that sound can be collected more naturally by the shape of the ear, and can travel down into the ear canal as it would with unassisted hearing. Depending on their size, some models allow the wearer to use a mobile phone as a remote control to alter memory and volume settings, instead of taking the IIC out to do this. IIC types are most suitable for users up to middle age, but are not suitable for more elderly people. A CROS hearing aid is a hearing aid that transmits auditory information from one side of the head to the other side of the head. Candidates include people who have poor word understanding on one side, no hearing on one side, or who are not benefiting from a hearing aid on one side. CROS hearing aids can appear very similar to behind the ear hearing aids. The CROS system can assist the patient in sound localization and understanding auditory information on their poor side. A bone anchored hearing aid (BAHA) is an auditory prosthetic based on bone conduction which can be surgically implanted. 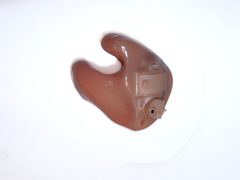 It is an option for patients without external ear canals, when conventional hearing aids with a mold in the ear cannot be used. The BAHA uses the skull as a pathway for sound to travel to the inner ear. For people with conductive hearing loss, the BAHA bypasses the external auditory canal and middle ear, stimulating the functioning cochlea. For people with unilateral hearing loss, the BAHA uses the skull to conduct the sound from the deaf side to the side with the functioning cochlea. These 'hearing glasses' incorporate a directional microphone capability: four microphones on each side of the frame effectively work as two directional microphones, which are able to discern between sound coming from the front and sound coming from the sides or back of the user. This improves the signal-to-noise ratio by allowing for amplification of the sound coming from the front, the direction in which the user is looking, and active noise control for sounds coming from the sides or behind. Only very recently has the technology required become small enough to be fitted in the frame of the glasses. As a recent addition to the market, this new hearing aid is currently available only in the Netherlands and Belgium. The principle of HAA operation corresponds to the basic principles of operation of traditional hearing aids: the microphone receives an acoustic signal and converts it into a digital form. Sound amplification is achieved by the means of a mobile computational platform, in accordance with the degree and type of users hearing loss. The processed audio signal is transformed into audio signal and output to the user into the headphones/headset. Signal processing is implemented in real time. Constructional features of mobile computational platforms imply preferred use of stereo headsets with two speakers, which allows carrying out binaural hearing correction for the left and right ear separately. HAA can work with both wired and wireless headsets and headphones. As a rule, HAA have several operation modes: setup mode and hearing aid mode. Setup mode involves the user passing an in situ-audiometry procedure, which determines the user's hearing characteristics. Hearing aid mode is a hearing correction system that corrects the user's hearing in accordance with user's hearing thresholds. HAA also incorporates background noise suppression and acoustic feedback suppression. There are quite a large number of mobile applications that implements a hearing aid. An example of such application is the Petralex hearing aid application. Petralex application is a popular hearing aid application (Microsoft Inspire 2017 P2P contest winner) that takes into account the surrounding acoustic environment and independently adjusts itself to the user's hearing characteristics, allowing the user to hear better. This application allows the user to create individual profiles for various acoustic environments (street, house, etc.). Application also works with both wired and wireless headphones and headsets. Functionality of hearing aid applications may involve a hearing test (in situ audiometry) too. However, the results of the test are used only to adjust the device for comfortable working with the application. The procedure of hearing testing in any way cannot claim to replace an audiometry test carried out by a medical specialist, so cannot be a basis for diagnosis. Oticon hearing aids for use with Bluetooth wireless devices. A T-coil consists of a metal core (or rod) around which ultra-fine wire is coiled. T-coils are also called induction coils because when the coil is placed in a magnetic field, an alternating electric current is induced in the wire (Ross, 2002b; Ross, 2004). The T-coil detects magnetic energy and transduces (converts) it to electrical energy. In the United States, the Telecommunications Industry Association's TIA-1083 standard, specifies how analog handsets can interact with telecoil devices, to ensure the optimal performance. In 2003, the FCC adopted rules to make digital wireless telephones compatible with hearing aids and cochlear implants. Although analog wireless phones do not usually cause interference with hearing aids or cochlear implants, digital wireless phones often do because of electromagnetic energy emitted by the phone's antenna, backlight, or other components. The FCC has set a timetable for the development and sale of digital wireless telephones that are compatible with hearing aids. This effort promises to increase the number of digital wireless telephones that are hearing aid-compatible. 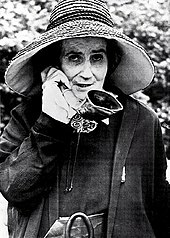 Older generations of both cordless and mobile phones used analog technology. 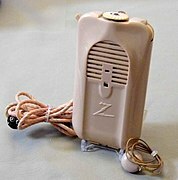 A hearing aid with an audio boot. Every electronic hearing aid has at minimum a microphone, a loudspeaker (commonly called a receiver), a battery, and electronic circuitry. The electronic circuitry varies among devices, even if they are the same style. The circuitry falls into three categories based on the type of audio processing (analog or digital) and the type of control circuitry (adjustable or programmable). Hearing aid devices generally do not contain processors strong enough to process complex signal algorithms for sound source localization. Personal Sound Amplification Products (abbreviated PSAP) are classified by the FDA as "personal sound amplification devices." These compact electronic devices are designed for people without hearing loss. Unlike hearing aids (which FDA classifies as devices to compensate for hearing impairment) use of PSAP does not require medical prescription. Such devices are used by hunters, naturalists (for audio observation of animals or birds), ordinary people (for example, to increase the volume of the TV in a quiet room), etc. PSAP models differ significantly in price and functionality. Some devices simply amplify sound. Others contain directional microphones, equalizers to adjust the audio signal gain and filter noise. The first hearing aids were ear trumpets, and were created in the 17th century. Some of the first hearing aids were external hearing aids. External hearing aids directed sounds in front of the ear and blocked all other noises. The apparatus would fit behind or in the ear. The movement toward modern hearing aids began with the creation of the telephone, and the first electric hearing aid, the "akouphone," was created about 1895 by Miller Reese Hutchison. By the late 20th century, digital hearing aids were commercially available. The history of DHA can be divided into three stages. The first stage – the widespread usage of computer simulation for the analysis of systems and algorithms for audio processing. The work was conducted with the help of the "big" computer of that time. Although they could not claim to be a real hearing aids (their performance was not enough for audio processing in real time – not to mention the size), they carried out successful studies of the various hardware circuits and algorithms for processing audio signals. The software package BLODI (stands for Block of Compiled Diagrams) developed by Kelly, Lockbaum and Vysotskiy in 1961 allowed to simulate any sound system provided in the form of a block diagram. With its help a special phone for users with hearing impairments was created. 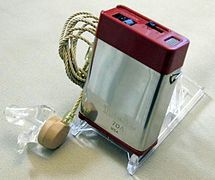 In 1967, Harry Levitt used BLODI to simulate a hearing aid on a digital computer. Hearing aids are also available privately, and there is grant assistance available for insured workers. Currently for the fiscal year ending 2016, the grant stands at a maximum of €500 per ear. Ordinary hearing aids are Class I regulated medical devices under Federal Food and Drug Administration (FDA) rules. A 1976 statute explicitly prohibits any state requirement that is "different from, or in addition to, any requirement applicable" to regulated medical devices (which includes hearing aids) which relates "to the safety and effectiveness of the device." Inconsistent state regulation is preempted under the federal law. In the late 1970s, the FDA established federal rules governing hearing aid sales, and addressed various requests by state authorities for exemptions from federal preemption, granting some and denying others. Hearing aid shop, Dublin, Ireland. Several industrialized countries supply free or heavily discounted hearing aids through their publicly funded health care system. In Canada, health care is a responsibility of the provinces. In the province of Ontario, the price of hearing aids is partially reimbursed through the Assistive Devices Program of the Ministry of Health and Long-Term Care, up to $500 for each hearing aid. Like eye appointments, audiological appointments are no longer covered through the provincial public health plan. Audiometric testing can still easily be obtained, often free of charge, in private sector hearing aid clinics and some ear, nose and throat doctors offices. Hearing aids may be covered to some extent by private insurance or in some cases through government programs such as Veterans Affairs Canada or Workplace Safety & Insurance Board. Social Insurance pays a one time fee of ISK 30,000 for any kind of hearing aid. However, the rules are complicated and require that both ears have a significant hearing loss in order to qualify for reimbursement. BTE hearing aids range from ISK 60,000 to ISK 300,000. Within the UK, the NHS provides digital BTE hearing aids to NHS patients, on long-term loan, free of charge. Other than BAHAs (Bone anchored hearing aid), where specifically required, BTEs are usually the only style available. Private purchases may be necessary if a user desires a different style. Batteries are free. In 2014 the Clinical Commissioning Group in North Staffordshire considered proposals to end provision of free hearing aids for adults with mild to moderate age related hearing loss, which currently cost them £1.2m a year. Action on Hearing Loss mobilised a campaign against the proposal. In June 2018 the National Institute for Health and Care Excellence produced new guidance saying that hearing aids should be offered at the first opportunity after hearing loss is detected rather than waiting for arbitrary thresholds of hearing loss to be reached. Most private healthcare providers in the United States do not provide coverage for hearing aids, so all costs are usually borne by the recipient. The cost for a single hearing aid can vary between $500 and $6,000 or more, depending on the level of technology and whether the clinician bundles fitting fees into the cost of the hearing aid. Though if an adult has a hearing loss which substantially limits major life activities, some state-run vocational rehabilitation programs can provide upwards of full financial assistance. Severe and profound hearing loss often falls within the "substantially limiting" category. Less expensive hearing aids can be found on the internet or mail order catalogs, but most in the under-$200 range tend to amplify the low frequencies of background noise, making it harder to hear the human voice. Military Veterans receiving VA medical care are eligible for hearing aids based on medical need. The Veterans Administration pays the full cost of testing and hearing aids to qualified military Veterans. Major VA medical facilities provide complete diagnostic and audiology services. The cost of hearing aids is a tax-deductible medical expense for those who itemize medical deductions. While there are some instances that a hearing aid uses a rechargeable battery or a long-life disposable battery, the majority of modern hearing aids use one of five standard button cell zinc–air batteries. (Older hearing aids often used mercury battery cells, but these cells have become banned in most countries today.) Modern hearing aid button cell types are typically referred to by their common number name or the color of their packaging. The type of battery a specific hearing aid utilizes depends on the physical size allowable and the desired lifetime of the battery, which is in turn determined by the power draw of the hearing aid device. Typical battery lifetimes run between 1 and 14 days (assuming 16-hour days). ^ "Ear Horn Q&A". Archived from the original on 24 July 2008. Retrieved 6 December 2007. ^ "Sergei Kochkin – MarkeTrak VIII: Consumer satisfaction with hearing aids is slowly increasing". journals.lww.com. Retrieved 18 February 2015. ^ J., Moore, Brian C. (2007). Cochlear hearing loss : physiological, psychological and technical issues (2nd ed.). Chichester: John Wiley & Sons. ISBN 9780470516331. OCLC 180765972. ^ Bentler, R. A.; Kramer, S. E. (2000). "Guidelines for choosing a self-report outcome measure". Ear and Hearing. 21 (4 Suppl): 37S–49S. doi:10.1097/00003446-200008001-00006. PMID 10981593. ^ Taylor, Brian (22 October 2007). "Self-Report Assessment of Hearing Aid Outcome – An Overview". AudiologyOnline. Archived from the original on 29 January 2015. Retrieved 29 May 2013. ^ Katz, Jack; Medwetsky, Larry; Burkard, Robert; Hood, Linda (2009). "Chapter 38, Hearing Aid Fitting for Adults: Selection, Fitting, Verification, and Validation". Handbook of Clinical Audiology (6th ed.). Baltimore MD: Lippincott Williams & Wilkins. p. 858. ISBN 978-0-7817-8106-0. ^ Stach, Brad (2003). Comprehensive Dictionary of Audiology (2nd ed.). Clifton Park NY: Thompson Delmar Learning. p. 167. ISBN 978-1-4018-4826-2. ^ Hartmann, William M. (14 September 2004). Signals, Sound, and Sensation. Springer Science & Business Media. pp. 72–. ISBN 978-1-56396-283-7. Archived from the original on 3 December 2016. ^ "Hearing Aids". National Institute on Deafness and Other Communication Disorders. Archived from the original on 15 September 2012. Retrieved 9 September 2012. ^ a b c d e f g h i j "Hearing Aid Buying Guide". Consumer Reports. February 2017. Archived from the original on 12 February 2017. Retrieved 13 February 2017. ^ "Problems with hearing aids: Ask our audiologist – Action On Hearing Loss: RNID". Action On Hearing Loss. Archived from the original on 17 June 2016. Retrieved 28 December 2016. ^ "Hearing Aids for Children". Hearing Aids for Children. American Speech-Language-Hearing Association. Retrieved 1 December 2014. ^ Eisenberg, Anne (24 September 2005) The Hearing Aid as Fashion Statement Archived 6 January 2016 at the Wayback Machine. NY Times. ^ Dybala, Paul (6 March 2006) ELVAS Sightings – Hearing Aid or Headset Archived 16 August 2012 at the Wayback Machine. AudiologyOnline.com. ^ Ross, Mark (January 2004) The "Occlusion Effect" – What it is, and What to Do About it Archived 15 February 2016 at the Wayback Machine, hearingresearch.org. ^ Sanford, Mark J., MS; Anderson, Tamara; Sanford, Christine (10 March 2014). "The Extended-Wear Hearing Device: Observations on Patient Experiences and Its Integration into a Practice". The Hearing Review. 24 (3): 26–31. Archived from the original on 5 December 2014. Retrieved 1 December 2014. ^ "Concealed Hearing Devices of the 20th Century". Concealed Hearing Devices of the 20th Century. Bernard Becker Medical Library. Archived from the original on 23 January 2015. Retrieved 1 December 2014. ^ "Why Don't They Made Hearing Aids Glasses Anymore". www.hearreview.com. Retrieved 27 November 2018. ^ Netherlands: Dutch Unveil 'Varibel' – The Eyeglasses That Hear Archived 15 April 2012 at the Wayback Machine, Publish Date: 1 March 2007, Related Company Website: www, varibel.nl. Accessed 10 February 2008. ^ "Mobile Medical Applications. Guidance for Industry and Food and Drug Administration Staff" (PDF). Food and Drug Administration. 2015. ^ a b A. Vonlanthen, H. Arndt (2009). Hearing aids (in Russian). Translated by T. Gvelesiani. Rostov-on-Don: Feniks. ISBN 978-5-222-15490-8. ^ "(PDF) PETRALEX/Dectone APP: Assistive Technology in service of the hard of hearing". ResearchGate. Retrieved 7 March 2019. ^ G. Keidser, E. Convery (2016). Self-Fitting Hearing Aids: Status Quo and Future Predictions. Trends in Hearing, Vol. 20. pp. 1–15. ^ D. Maidment, M. Ferguson (2018). An Application of the Medical Research Council's Guidelines for Evaluating Complex Interventions: A Usability Study Assessing Smartphone-Connected Listening Devices in Adults With Hearing Loss. American Journal of Audiology, Vol. 27. pp. 474–481. ^ Mestayer, Kathi. "Staff Writer". Hearing Health Magazine. Archived from the original on 22 February 2014. Retrieved 13 February 2014. ^ "New TIA Standard Will Improve Hearing Aid Compatibility with Digital Cordless Phones". U.S. Telecommunications Industry Association. 5 April 2007. Archived from the original on 6 December 2010. Retrieved 3 November 2011. ^ "Приложение для смартфонов заменит глухим слуховой аппарат? – Глухих.нет. Новостной портал для глухих и слабослышащих | Новости мира глухих и слабослышащих | Сайт глухих | Спорт глухих | Can application substitute hearing aid?". gluxix.net. Retrieved 18 February 2015. ^ "Mobile Medical Applications". fda.gov. Retrieved 18 February 2015. ^ Mroz, Mandy. "Hearing Aids and Bluetooth Technology". Hearing Aids and Bluetooth Technology. Healthy Hearing. Archived from the original on 9 November 2014. Retrieved 1 December 2014. ^ Dave Fabry; Hans Mülder; Evert Dijkstra (November 2007). "Acceptance of the wireless microphone as a hearing aid accessory for adults". The Hearing Journal. 60 (11): 32–36. doi:10.1097/01.hj.0000299170.11367.24. ^ Hawkins D (1984). "Comparisons of speech recognition in noise by mildly-to-moderately hearing-impaired children using hearing aids and FM systems". Journal of Speech and Hearing Disorders. 49 (4): 409. doi:10.1044/jshd.4904.409. ^ Ricketts T.; Henry P. (2002). "Evaluation of an adaptive, directional-microphone hearing aid". International Journal of Audiology. 41 (2): 100–112. doi:10.3109/14992020209090400. ^ Lewis, M. Samantha; Crandell, Carl C.; Valente, Michael; Horn, Jane Enrietto (2004). "Speech perception in noise: directional microphones versus frequency modulation (FM) systems". Journal of the American Academy of Audiology. 15 (6): 426–439. doi:10.3766/jaaa.15.6.4. ^ "Public Law 100-394, [47 USC 610] – Hearing Aid Compatibility Act of 1988". PRATP. Archived from the original on 26 July 2010. Retrieved 8 June 2013. ^ "Boot Definition". www.nchearingloss.org. Retrieved 2 June 2017. ^ "Boot Definition". www.nchearingloss.org. Archived from the original on 3 March 2016. Retrieved 2 June 2017. ^ Heidtman, Laurel (28 September 2010). "Analog Vs. Digital Hearing Aids". LiveStrong.com. Archived from the original on 3 May 2012. Retrieved 23 July 2012. ^ Levitt, Harry (26 December 2007). "Digital Hearing Aids". The Asha Leader. Archived from the original on 17 July 2012. Retrieved 23 July 2012. ^ "Как работают слуховые аппараты". radugazvukov.ru. Archived from the original on 25 December 2014. Retrieved 18 February 2015. ^ Janet McCaffrey (21 December 2009). "HJ0905 Kochkin copy" (PDF). The Hearing Journal. Retrieved 18 February 2015. ^ "Fitting Tips: Essentials of Hearing Aid Selection, Part 1: Cosmetics Are Not Just What Meets the Ear – Hearing Review". hearingreview.com. Retrieved 18 February 2015. ^ Richard Preid Fotorotar AG (8 August 2007). "24_P54090_Pho_Kapitel_06bis07" (PDF). Retrieved 18 February 2015. ^ "Hearing Review Three-Year Index 2003–2005 – Hearing Review". hearingreview.com. Retrieved 18 February 2015. ^ "Применение технологии широкополосного изменения огибающей спектра звукового сигнала Petralex® в онлайн-приложениях коррекции слуха::Журнал СА 7–8.2014 (Mann, Eric A., M.D., Ph.D., "Hearing Aids and Personal Sound Amplifiers: Know the Difference", U.S. Food and Drug Administration Consumer Updates website, Oct. 20, 2009. Retrieved 2013-05-23.)". samag.ru. Retrieved 18 February 2015. ^ Beck, Melinda, “Getting an Earful: Testing A Tiny, Pricey Hearing Aid”, The Wall Street Journal, Jan. 29, 2008. Retrieved 2013-05-23. ^ Mills, Mara (2011). "Hearing Aids and the History of Electronics Miniaturization". IEEE Annals of the History of Computing. 33 (2): 24–45. doi:10.1109/MAHC.2011.43. ^ Howard, Alexander (26 November 1998). "Hearing Aids: Smaller and Smarter." Archived 28 December 2016 at the Wayback Machine New York Times. 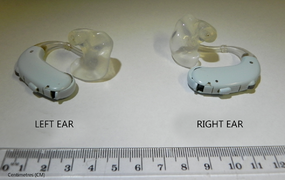 ^ a b c "LEVITT: Digital Hearing Aids: A Tutorial Review" (PDF). rehab.research.va.gov. Retrieved 18 February 2015. ^ Kelly LJ, Jr.; Lochbaum C; Vyssotsky VA:. A block diagram compiler. Bell System Tech J (40):669–676, 1961. ^ a b Graupe D, Grosspietsch JK, Basseas SP. "A single microphone-based self-adaptive filter of noise from speech and its performance evaluation. J Rehabil Res Dev 24(4), 1987 (this issue" (PDF). rehab.research.va.gov. Retrieved 18 February 2015. ^ "Aural". Ireland Department of Social Protection. Archived from the original on 2 July 2012. Retrieved 23 July 2012. ^ a b 21 U.S.C. § 360k (a) (2005). ^ Final Rule issued in Docket 76N-0019, 42 FR 9286 (15 February 1977). ^ Exemption from Preemption of State and Local Hearing Aid Requirements; Applications for Exemption, Docket No. 77N-0333, 45 FR 67326; Medical Devices: Applications for Exemption from Federal Preemption of State and Local hearing Aid Requirements, Docket No. 78P-0222, 45 FR 67325 (10 October 1980). ^ "Understanding the Australian Government Hearing Services Program". Archived from the original on 9 September 2007. Retrieved 4 December 2007. ^ "Loud and clear". Health Service Journal. 18 December 2003. Archived from the original on 23 October 2014. Retrieved 17 October 2014. ^ "Hearing aid charging opposed in feedback exercise". Health Service Journal. 23 September 2014. Archived from the original on 9 October 2014. Retrieved 17 October 2014. ^ "Doctors should prescribe hearing aids at first sign that hearing loss is affecting life". Daily Mail. 21 June 2018. Retrieved 21 June 2018. ^ "Questions and Answers about Deafness and Hearing Impairments in the Workplace and the Americans with Disabilities Act". U.S. Equal Employment Opportunity Commission. Archived from the original on 4 March 2016. Retrieved 26 November 2007. ^ Mahany, Barbara (9 March 2011). "Now Hear This". Chicago Tribune. Archived from the original on 15 June 2013. ^ Romano, Tricia (22 October 2012). "The Hunt for an Affordable Hearing Aid". Well. New York Times. Archived from the original on 25 February 2015. ^ "Topic 502 – Medical and Dental Expenses". Internal Revenue Service. Archived from the original on 3 July 2017. Retrieved 26 November 2007. ^ Kochkin, Sergei (October 2010). "MarkeTrak VIII: The efficacy of hearing aids in achieving compensation equity in the workplace". The Hearing Journal. 63 (10): 19–24, 26, 28. doi:10.1097/01.HJ.0000389923.80044.e6. Retrieved 18 February 2015. 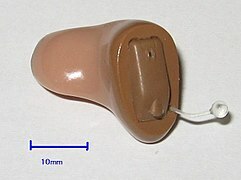 Wikimedia Commons has media related to Hearing aids.